The Son of Man himself did not come to be served but to serve, and to give his life as a ransom for many. Merciful God, You gave Brother Jeremiah of Wallachia the grace of imitating Your Son in serving his brothers and giving himself unconditionally in service for them. Help us to follow the evangelical way of humility and love, so that we may cooperate more fully in Your universal plan of salvation. Holy Father, You exalted blessed Benedict of Urbino for his ardent love for the cross and the ministry of the Word, grant that we may follow his example, by living in this world in faith, justice and peace. 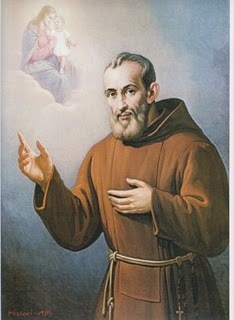 Blessed Benedict of Urbino (1560-1625) was born into a family of privilege who received a fine education in law prior to professing vows as a Capuchin Franciscan in 1584. His preaching and teaching effective for the salvation of souls, he walked with Saint Lawrence of Brindisi in preaching the gospel. His conversion to live the gifts of religious profession and priesthood happened when he called to a poor pregnant woman’s house to give the sacrament of the sick who was at death’s door. Upon realizing that no was called due to the lack of funds –that is, no good medical care for a pregnant woman is not new news– he stayed with the woman, baptizing the child until their death. His helplessness stirred his emotions which propelled him to be of greater help to women, especially the poor. Pope Pius IX beatified Benedict of Urbino on February 10, 1867. Lord God, You made blessed Luchesio whom You called to repentance illustrious in performing works of piety and charity. Through his prayers and example may we bring forth worthy fruits of penance and always abound in good works. Blessed Luchesio (Luchesius; Lucius) died in 1242 was the first to accept the invitation of Saint Francis of Assisi to live the Rule of 1221; today we call the people living this Rule the Secular Franciscan Order, or sometimes the Third Order Laity. 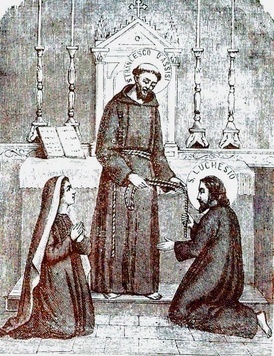 Lechesio was a husband, a businessman, a penitent who was dedicated to prayer, penance and works of charity. But Luchesio was not always the most pious, bible believing, Christian man in his neighborhood: he had a reputation for being greedy and ambitious; he was the 13th century equivalent to our financial and political scam artists today. Grace set to work on Luchesio and then he encountered Saint Francis who took Luchesio’s conversion another step deeper into the Christian life by giving witness to the possibility of becoming a saint by living a poor, obedient and chaste life in an effort to be holy. 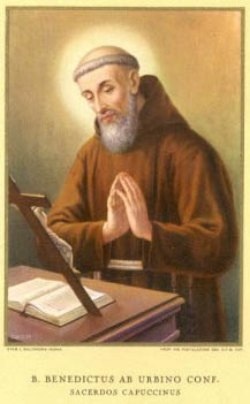 May Blessed Luchesio look kindly upon the Secular Franciscan Order by asking the Lord for the gifts of faith, hope and charity and a life of humility. I thank Christ Jesus our Lord, who has strengthened me, that he has made me his servant and judged me faithful, alleluia. God, our Father, You were pleased to adorn Saint Fidelis with the palm of martyrdom. He burned with love for You in propagating the faith. Through his prayers grant that we may be firmly rooted in love and merit to experience with him the power of Christ’s resurrection. An academician by training (philosophy and law) he knew the difficulties of being faithful in passing on the truth to eager students. It seems that university life was not particularly Christian in Saint Fidelis’ time as we would claim for our own. Even before his time as a Capuchin friar, Fidelis (in history he was Mark Roy) had a habit of frequent attendance at Mass, adoration of the Blessed Sacrament and works of charity among the sick and the poor. At the age of 35 (a late vocation) Fidelis entered religious life having always wanted to be a Capuchin friar. He’s known to have lived a life of penance and prayer. As a newly ordained priest he celebrated his first Mass on the feast of Saint Francis making a strong personal connection with the man who changed civilization. Early in his religious and priestly life the Capuchin superiors thought of Fidelis as a key figure in the counter-reformation. Designated a guardian of a friary in Switzerland, Fidelis set out to use his learning to lead the Calvinists and Zwinglians back to the Church. In fact, the Holy See missioned Fidelis to establish a preaching band to teach the true faith and to contradict the errors of Magisterial reformers in Switzerland. Angered by his faithfulness to Christ and to the Church, the radical, heretical Protestants ambushed Fidelis, hacking him to death. Prior to death, Fidelis witnessed to the mercy of Christ by asking God to forgive his killers. It is reported that Fidelis’ body, though in pieces, was incorrupt for a long period; at the request of the ecclesial authorities Fidelis’ remains were placed in two reliquaries for the faithful to venerate. 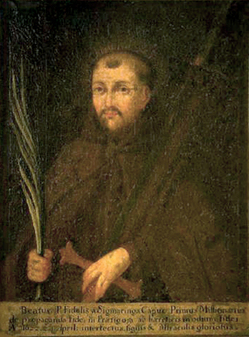 Among the Capuchin saints, Saint Fidelis has the distinction of having the fewest years of Capuchin vows (he was only 9 years a friar) than the others at the time of his canonization. The just man will flourish like the palm tree. Planted in the courts of God’s house, he will grow great like the cedars of Lebanon, alleluia. Lord God, You were pleased to raise Giles to the heights of exalted contemplation. Through his intercession grant that we may always direct our actions to You and attain the peace which surpasses all understanding. Blessed Giles of Assisi was among the very first companions of Saint Francis of Assisi. Unlettered, Giles devoted himself to the pious life: everything he set out to do was squarely focussed on God. In fact, one observes in the hagiography Giles relentlessly seeking God’s face and strongly urging others to the same. Giles did what the Lord asks of us: to be in relationship with Him. He once told Pope Gregory IX, who was looking for counsel from Giles, that he had to have two eyes of the soul: one eye fixed on matters of heaven and the other matters of earth. His life and preaching was simple but his goal was sublime. After speaking with Saint Bonaventure who at the time was a theologian and provincial, Giles understood that prayer and contemplation was possible for all people. Have at it. May Blessed Giles lead us to the face of Christ.